I could use some brightening of the gloom that has hung over Austin yesterday and today. Red oak happens to be one of those trees that really should be more popular here than it is. For some reason, it does not make too many acorns! I really do not know why. I know that is something that people dislike about it in other regions, but we just do not have a problem with it. Sometimes, I wonder if it is just because there are no old specimens about, and that they will eventually start to make acorns and become a problem, but by that time, they will be too prominent to cut down. Over the last couple of weeks the Monterrey oak on our front lawn has dropped a mess of acorns along the curb. Monterrey oak? Is that Monterrey in Texas, and is it spelled with two ‘r’s? From what I can tell, it’s the Monterrey in Mexico. This species is apparently also called Mexican white oak. The USDA map shows it growing in one Texas border county. Oh, Quercus polymorpha! I have never heard of it. It does not look like a white oak. It looks more like a Southern live oak. If you could see the actual tree on my lawn you wouldn’t take it for a live oak. There are surprisingly few good pictures of it online. I am not certain if that article makes me like or dislike it. With so many oaks in Texas, I am not certain I would want an exotic in my own garden. I like exotic oaks here only because the natives do not like landscape situations so much. There happens to be a link to another article about the Mexican sycamore that is becoming more popular in the Los Angeles region. I rather dislike the London plane, but I am not certain that I like the Mexican sycamore any more. Right. I wouldn’t have planted a Monterrey oak, given that it’s not native within hundreds of miles of here, but the tree was already growing when we moved in in 2004. That is how I got my sweetgum that was planted in 1959 or so. I really liked that tree. Not many of our native trees work well in landscapes. Oaks can be so baffling. Our native California black oak is the closest we have to a red oak, but it is really more closely related to a live oak. I don’t know how that works. Our native white oak is known as the valley oak, and it really is grand. For many years, I lived next door to what was purported to be the biggest valley oak in the Santa Clara Valley. Those are beautiful photos of those leaves! I wanted to leave a good impression, and your comment says I did. As with most things aging, these have acquired a lot of character to accompany the color. May the same be said of us! They made my morning, no question. It’s like a gift in winter!! As are the various stray wildflowers that have been popping up this week. It’s been gray here, too, so this was a welcome look back to 11 days ago. These are just lovely shots, Steve. When we contemplated moving to Austin, we were concerned that we would miss fall colors, a favorite here in Upstate NY. I should have listened to my inner self. I don’t regret my decision but I do love Texas! I had no idea (or else forgot!) that you once contemplated moving to Austin. Yes, we have isolated bright year-end colors, but you probably would have come to miss the vaster fall foliage of upstate New York. You probably wouldn’t have missed your region’s long, long winters. I heard on the news the other day that Austin’s within-city-limits population might reach one million in the next census; how you’d have liked living in such an increasingly crowded place, I don’t know. Great studies Steve. These would look great in a living room. Our living room walls currently display some photographs that I had printed on metal. Maybe it’s time for some more. I’d love to see how they look in metal. Can that process still be done? Just be aware that prints cost more on metal than on paper. Amazing, didn’t know about this service. I haven’t tried Costco for metal prints yet but I may do a sample or two to see what the quality is like. Does it add some sheen to the print? Thanks for the link. Seems worth the try at least with one of those offers! I’m just wondering if “sudden oak death” is reaching your end of the country. It seems that we’re anticipating its spread here from California. I’ve seen signs in neighborhoods here warning people not to prune their oak trees at certain times of the year. Thanks for the link. That was one of the best summaries I’ve yet seen. I’m especially taken with the second photo. Not only are the colors delightful (a true, unblemished orange seems unusual to me), the texture is luscious, and the edge detail is perfect. I’ve been trying to identify some trees that I believe to be elms, and now I know for certain that they aren’t cedar elm. I just can’t get over that texture; I can almost feel its roughness under my fingers. The “crass” in the species name gets it right for cedar elms, whose leaves are rough and stiff. 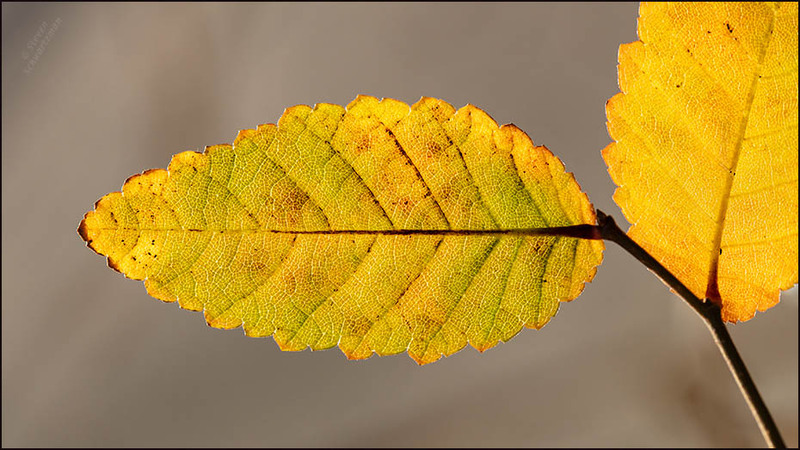 While I don’t know how to tell other elms apart, the texture of cedar elm leaves makes identification easy. As for the orange, it’s not all that common in this species, but it isn’t truly rare, either. 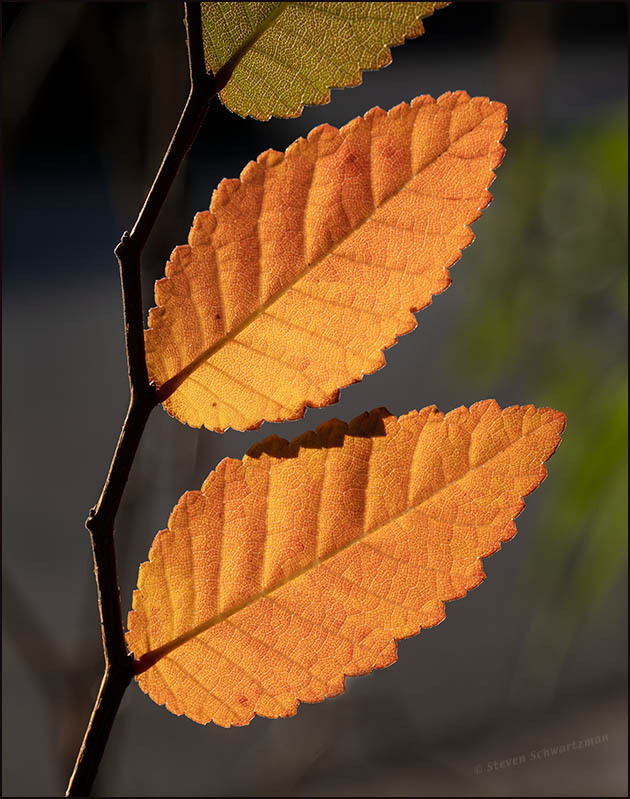 What seems unusual is for two leaves to be so almost uniformly orange. Whether they passed through a yellower stage, I don’t know. 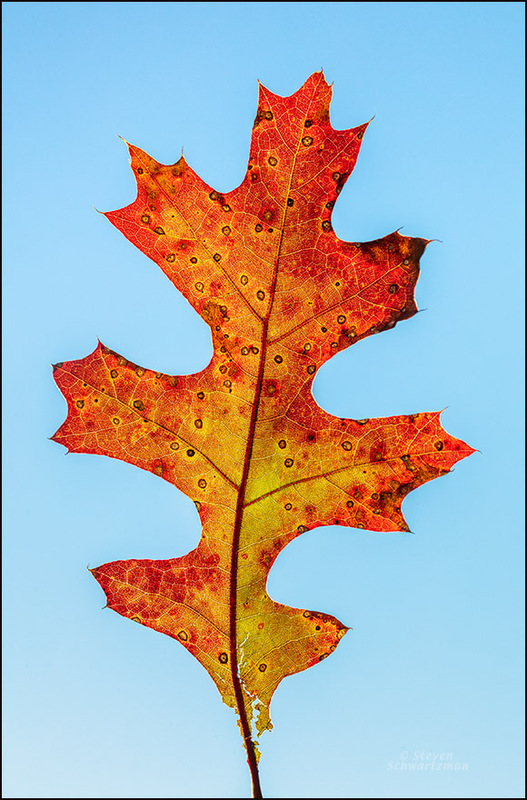 I notice that the portion of the leaf visible above them has margins that are turning orange, with the color seeming to be spreading to the interior. And speaking of margins, in some of the pictures that I took, the tips of the leaves didn’t stay in focus with the wide aperture I had to use. As long as I got a few sharp images, I was happy.